Educators who make up the Ujima Collective discuss how to create an engaging space for their black male students. Photo courtesy of Wikimedia Commons. Imagine entering a place every day where you can gain the skills you need to make your dreams come true. A place where you are nurtured, loved and valued. Your unique skills are recognized and celebrated, your experiences validated. Your sense of self affirmed. And yet, this is how Black male scholars describe their ideal school experience. For 15 years, the responses have been consistent among our students: This is school as they would like it to be—a stark contrast from the schools where they spend most of their days. Many say they struggle to even feel welcome. There are no inherent flaws in our boys. So why is this happening? Why does the school system keep producing these outcomes? In Spring of 2013, I (Alex) was offered the opportunity to teach a class for ninth grade Black boys at Patrick Henry High School. I immediately called Adrian Mack and Marcus Zackery. For the past 12 years, our work in the community frequently intersected, and we became close friends and collaborators. We often spoke about having a space to support success of our students. This was our chance. Later, we were joined by my long time colleague Rosa Costain, a first-year teacher and former dean of students. Rosa was asked to teach PREP, a new freshman college preparatory program. Our task was to create a curriculum that supported the success of Black male scholars. We believed identity was a key component and set about creating a curriculum that deconstructed Black male identity using the media, social institutions, and American culture as tools. We spent a summer building a curriculum using research, our experiences and shared values. When class began, we asked the students, “Who are you?” and analyzed narratives from current and historical perspectives of Black male identity. Equal time is spent comparing those narratives to their own. In addition, students spent time identifying their strengths and unique qualities. 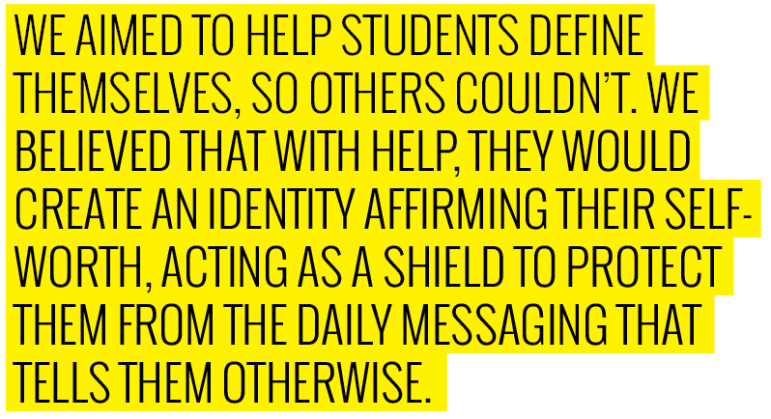 We aimed to help students define themselves, so others couldn’t. We believed that with help, they would create an identity affirming their self-worth, acting as a shield to protect them from the daily messaging that tells them otherwise. As Black males and educators, we know the importance of creating a space where students can explore themselves and these concepts. This space had to be different than the traditional authoritarian-style classroom. As we envisioned this, I (Marcus) was reminded of an important moment during my senior year at Minneapolis North Community High School in 1997. I had a language arts class with a popular teacher. He was a middle-aged white man who we called by his first name. He said he wanted to be on the same level as his students. That alone captured my attention. It gave me a different level of respect for him. In retrospect, I am still in awe of how my teacher created a comfortable space to talk about those topics. Not only with Black students, but other ethnicities and backgrounds, including white students. What was his process? One thing he did was take time to build relationships with his students. He got to know us as individuals, and not simply a group of students in a class. For example, I had voiced many times in class that NAS was my favorite rapper. A few weeks later, he printed off an article about NAS that he believed I would find interesting. I was one among many students to whom he made these small gestures. It was his attentiveness and interest in us that allowed him to have great relationships with us. We knew he cared. Knowing our teacher cared allowed us to develop a level of trust. It went both ways. As students, we could voice our opinions without the fear of being right or wrong. He trusted that we could engage in difficult dialogues about race, prejudice and discrimination with the maturity needed to agree or disagree respectfully. That experience shaped me as an educator. Building relationships and establishing trust would be foundational to our work. School often emphasizes rote learning, limited learning styles and a lack of appeal to students. It’s an uncommon practice to incorporate student input about the learning process, and consider how what they learn impacts their lived experiences. We worked to provide a space for this to happen. Our classroom is non-traditional and unconventional, in philosophical approach and set-up. Students, particularly young Black males, must have some ownership of their learning space so they feel connected to what they learn. Traditional classroom settings place the teacher at the center and as the authority. Within our first week, we even realized the traditional classroom seating didn’t work for us. Rosa suggested we create a semi-circle. It allowed us to create a shared space where students and teachers could easily interact with each other, and shift the teacher-centered dynamic to one where we were all participants. The instructors could move freely and interact with all students. The students were able to interact with their classmates and instructors alike. We’re still in a traditional classroom, but students find ways to get comfortable. It is not uncommon to see students sitting on a radiator, or laying on top of two desks. This was a compromise we made, since our priority was student engagement. We noticed when the students took ownership of their learning space, the ownership of the content followed. Often, students will remind us that this class is different. “It’s not like my other classes,” they say. A shared learning space fostered another primary goal to level the learning experience. This translated in two ways. First, that the teacher is not always the authority on knowledge and content. We aimed to create lessons that sparked interest and curiosity. We made efforts to highlight our limitations on the subject. We elicited their knowledge and experience, while highlighting our limitation on the subject. We couldn’t simply teach them our definition of Black manhood and declare it as the gospel. It was important they understood Black men did not belong in a monolithic perspective. We relied on the students’ understanding of Black manhood, and respected their knowledge. Second, the value of that knowledge stems from all our shared experiences. The students’ interpretations, opinions or reflections are just as valuable as the instructors’. As a result of the increased media coverage of police violence and shootings of Black men and women, we often had to use the classroom space to talk about it. With Ferguson, Baltimore, and most recently Jamar Clark, we have accepted the responsibility of creating a space for students to process their thoughts and feelings. We cease being instructors and enter the space with them. Not only as a Black male, but as fathers and husbands who are susceptible to the same fears and feelings. After Jamar Clark was killed, I (Alex) struggled to begin class. Protesters had just taken over the Fourth Precinct. I opened the space and shared that I was overcome by personal frustration. I felt helpless, and it sickened me. As a man, I couldn’t protect my son, or my students, for whom I cared so deeply. I stopped being an expert and became a part of the classroom community, trying to make sense of it all. We listened as the students shared their opinions and feelings. They were experts, too. We spent several minutes in silent reflection, knowing that on some level our pain was shared. We do not regret using classroom time this way. Those dialogues supported the curriculum. We touched on policy reform, the historical relationship between Black men and the police, social movements and our duty as citizens. When we approached this content, it was easier to teach, as we had created an authentic and organic learning space. If we are lucky enough, we can all recall a teacher who challenged us, and made us think differently about a subject. More than likely, that teacher offered a little information, pushed you to think critically and then elicited your reflections. By doing this, that teacher affirmed your value. Black male students must be able to share their opinions and stories, and take ownership of their learning. It affirms them and validates what they know. Like most of us, if they can’t find the value in the subject matter, and know how it applies to life experiences, they won’t care to learn it. To be valued in a classroom creates trust. It allows students to feel comfortable relating to one another, contributing to the class and demonstrating leadership. Too often, Black students feel insecure about what they know and have to offer in school. Furthermore, when their sense of value and worth in the classroom is low, they lose the ability to relate and “feel” the content. The result is usually to disconnect from the content. Several of our students have daily stories to share. When discussing prejudice and discrimination, one in particular contributes by sharing his own encounters with prejudice or perceived discrimination. Black male students need a space to be subjective and reflective. For our class to be effective, we must offer a way to make sense of their learnings. We must also be willing to share our feelings and experiences. The process of connecting new information with the old, by taking account of their feelings and experiences, fosters the connection in their lives. 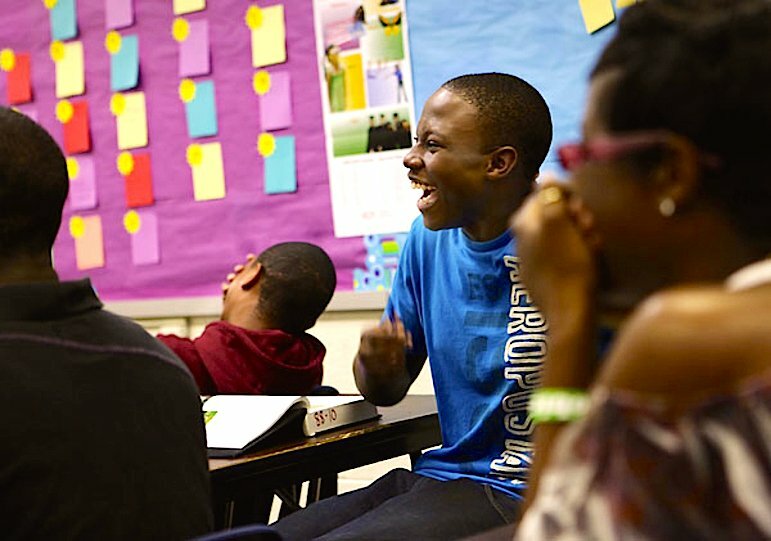 Mainstream educational models have largely been ineffective with Black male students. While heavy research and resources have been devoted to investigating learning styles, teacher practices and class environment, most of the knowledge has not transferred from the realm of theory into practice. Our practice is more than just a rich knowledge of Black identity, racism and history. The class offers our students something they often don’t find in school: space. More notably, their own space. This space offers them validation, affirmation, relatability and a chance to experience teachers walking alongside them on their journey of learning. The space introduces content that is often not discussed in a typical classroom environment. While the content is provocative, their contributions and reflections to the content, informs how the content is accepted and shared. Last year one of our students made a notable observation. “I don’t understand why we can’t talk and do some of the stuff in other classes that we do in here. This class just allows me to talk, say things, things that I normally don’t get to talk about. Especially in school. I knew I understood the things we learn, but I feel like I have a better voice with it now.” Imagine if they felt this way about every classroom. We are on the right track. The Ujima Collective is comprised of, but not limited to, Alex Leonard, Adrian Mack and Marcus Zackery. Ujima is a Swahili term meaning collective work and responsibility. As educators, the members of the collective are guided by the term and see it as crucial to the continued success of Black students. Alex Leonard is a student dean at Patrick Henry High School and currently pursuing a masters in school counseling. Adrian Mack is a frequent lecturer on African American history, having conducted workshops on all academic levels, including college. Marcus Zackery is area director of the Boys and Girls Club. Together the Ujima Collective has been quietly engaging in many initiatives involving Black male achievement throughout North Minneapolis. Important work! Thank you for including an example of a white teacher’s success in reaching his students. Thank you for doing such important work with young people. It matters!